A lack of adherence to proper safety practices is one of the greatest contributing factors to injury in a person's life. This is applicable with respect to driving practices, product safety, property safety and many other areas. We are all responsible in some part for our own safety. Government and medical institutions also play a large part in structuring safety guidelines, and in creating and administering safe environments for all Canadians. A recent development promoting the safety of many of Waterloo Region's residents is the availability of a service which will allow individuals who are deaf to make contact with 911 emergency services. Accidents frequently occur in and around the home, sometimes when victims are alone and without help, so the ability to more easily contact emergency services when you are injured often makes the difference between life and death. It is notable that 2014 had the highest incidence of calls for paramedic services. Some attribute this increase to the fact that 911 was increasingly called when the medical circumstances were actually not an emergency. Our aging population may also play a role in the increase; however, the latter issue supports a need for easy access to emergency services, while a misuse of the 911 service may put people with real medical emergencies at risk if the service is overwhelmed and thus, temporarily unavailable. Despite laws, rules and regulations governing safe practices, anyone can suffer from a personal injury at any time. Whether it is from a common slip, trip and fall accident or a motor vehicle collision, injuries sustained from an accident can range from minor to catastrophic. The severity of injuries depends on the circumstances surrounding the accident as well as personal characteristics of the victim. For example, the walking surface (ice, carpet, snow, gravel) and speed of movement can significantly affect the nature and degree of injuries from a slip, trip and fall. In some instances, we bear a large part of the blame for out injuries, such as when we wear inappropriate footwear in icy conditions, or when we fail to clear our windshield from snow before beginning our drive in the winter. At other times, despite our best efforts, we fall victim to a careless driver, poorly maintained property or another circumstance where a person or owner did not take reasonable care and we were injured as a result. On many occasions, injuries are minor and we recover quickly. However, when accident victims suffer serious or permanent injuries, the ramifications are often costly and life-changing. In these situations, innocent victims need and deserve full compensation for the many expenses, lost income and other costs that resulted from the accident. Short or long-term disability sometimes results from personal injury. The key to a full and timely recovery, to the best degree possible for a given injury, is seeking immediate medical attention after an accident and undergoing the appropriate rehabilitative medical care. For accident victims and their families in need of a Kitchener-Waterloo personal injury attorney, the Injury Lawyers of Ontario (ILO) law affiliates is a group of select personal injury firms providing service to many communities throughout Ontario. Our local law offices have deep-rooted connections in the Kitchener-Waterloo area. We will work with you to develop a strong case based on your individual circumstances, to ensure that you are fairly compensated for damages, both economic losses and pain and suffering (non-pecuniary). When you have been injured in an accident, there are many reasons for seeking prompt medical attention. The sooner you are medically evaluated, the better your chances of a proper diagnosis and treatment. Failure to treat an injury can lead to a worsening physical state and can also negatively impact your chances for receiving compensation for your injuries (contributory negligence). Health records and medical expert opinion provide valuable documentation of your injuries, medical treatments, future care needs, and your general health outlook, and are vital in achieving appropriate compensation for current and future expenses. Input from medical experts can also be used in attaching a monetary value to pain and suffering damages. The personal injury attorneys at ILO are Kitchener-Waterloo residents who understand the community and have ties to medical and law enforcement professionals who can assist with your case. 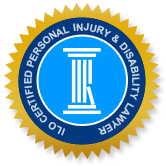 Our expertise in areas such as car accidents, motorcycle accidents, insurance disability benefits, catastrophic injuries, product liability and slip and fall injuries have made us very notable in our field. We have the knowledge to help you through all the stages of your claim. We offer a free initial consultation and you can reach us online or via telephone, so that you can have your case professionally assessed without feeling contractually obligated. We make finding a lawyer in your area easy and effortless and assure you top quality legal service in the personal injury field. ILO staff understand the challenges of getting back on your feet after being injured in an accident, and know the importance of health and mobility to our clients. You deserve the best care possible, and we will do everything in our power to ensure that you receive it.